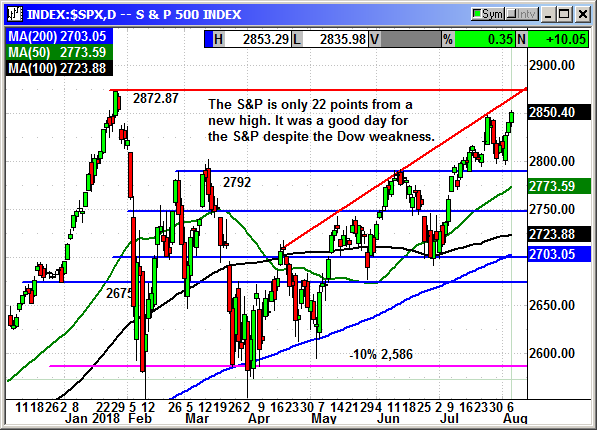 The market was positive but calm as we move into the August doldrums. 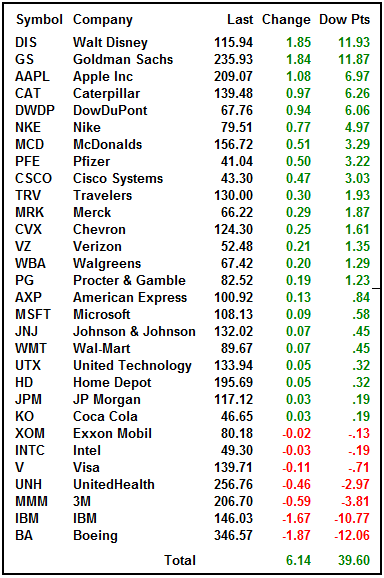 The Dow remains the laggard and the three biggest losers on Monday were tariff threatened stocks MMM, IBM and BA. 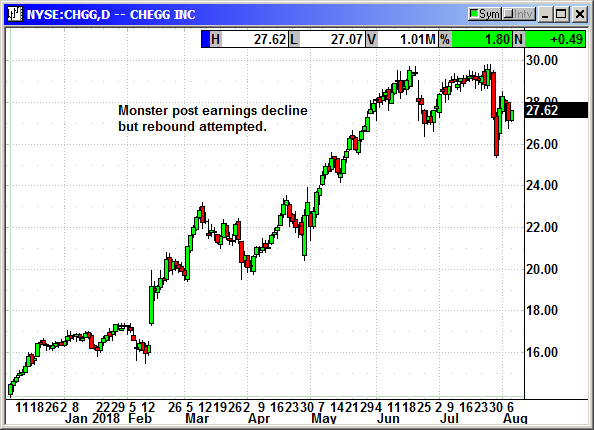 Caterpillar actually closed positive thanks to their raised guidance but they will eventually fall back into the losers column. 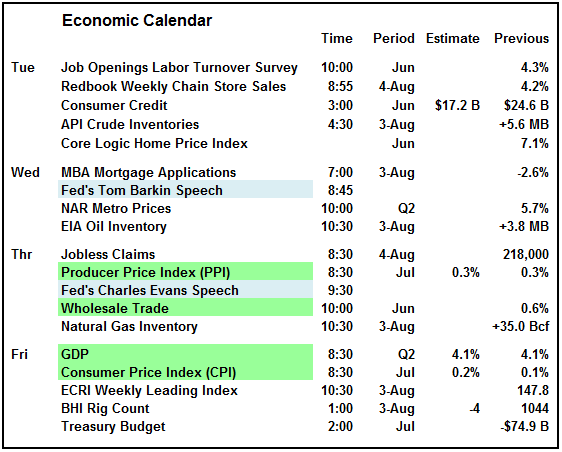 There was very little happening in the market with only one economic report that is normally ignored. The economics will not pick up until late in the week. Volume is starting to decline as families try to squeeze in one more vacation week before school begins the following week. All of the back to school activity tends to draw the focus away from trading for investors with families. The volume will slow even further as the month progresses. The earnings calendar is busy but lackluster. Disney is the highest profile stock to report this week and that happens on Tuesday. There are still just under 100 S&P stocks to report but they are the smaller ones and will be strung out over the next four weeks. The heart of the earnings cycle has passed. The Dow was positive for the day but the individual stock gains were lackluster. Only fice stocks moved more than $1. 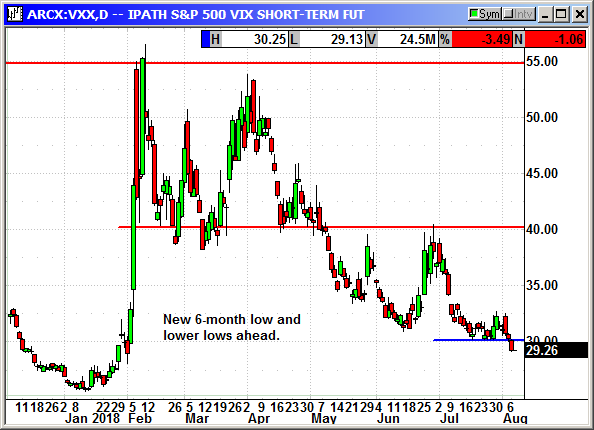 The now constant tariff chatter is keeping the lid on the gains but some investors have already penciled in a favorable outcome and that is lifting equities. 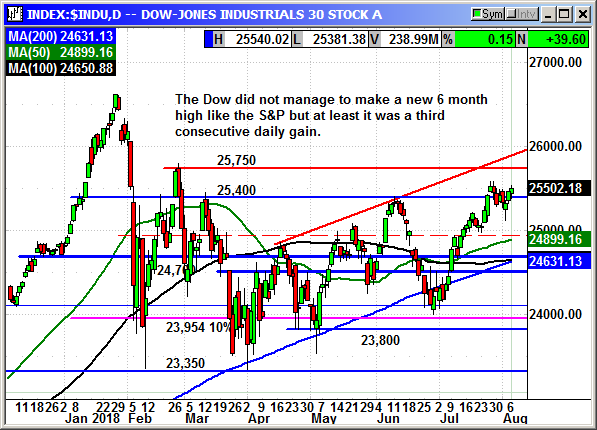 The Dow has resistance at 25,550 and again at 25,750 and uptrend resistance at 26,000 before reaching the prior high at 26,616. Those are a lot of hurdles to cross in a tariff minefield. The S&P managed to close fractionally over 2,850 but is rapidly approaching strong resistance at 2,865 and 2,872 and the prior high. Assuming we do not trip over a severely negative headline, the S&P could make a new high soon. Whether it can move over that level in an uncertain environment is the $64 question. 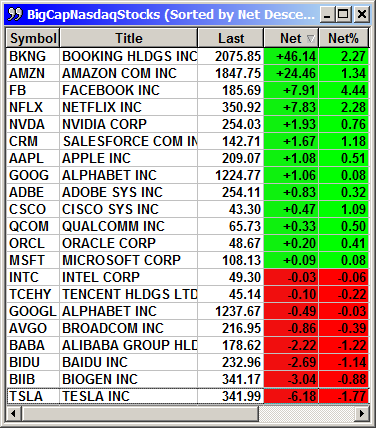 The Nasdaq big caps were mixed but strong performances by FB, NFLX and AMZN helped keep is in positive territory. Facebook and Netflix each gained $8. The positive point on the graphic below is that the stocks in negative territory posted only minor losses. 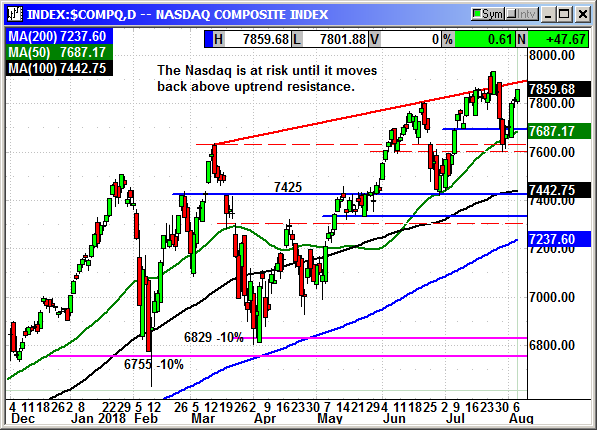 With the Nasdaq less than 100 points from a new high that 7,832 level is like a tractor beam pulling the index ever closer. 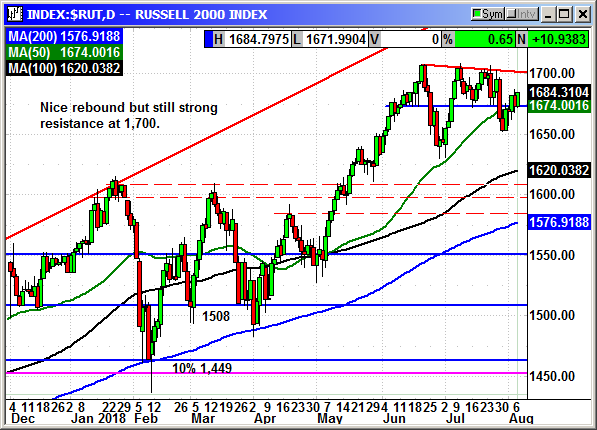 The Russell 2000 is alternating days between positive and negative but today it recaptured some of the prior losses. There is very strong resistance at 1700-1708 and a breakout there could light a fire under the market. I would continue to be cautious about overloading your account. A severely negative tariff headline could appear at any time and completely change the tone of the market. Currently, it appears investors are pricing in a successful conclusion to the trade negotiations. As long as that outlook does not change, we should be ok but it could change at any time. Microsoft Corporation develops, licenses, and supports software products, services, and devices worldwide. The company's Productivity and Business Processes segment offers Office 365 commercial products and services for businesses, including Office, Exchange, SharePoint, Skype for Business, and related Client Access Licenses (CALs); Office 365 consumer services, such as Skype, Outlook.com, and OneDrive; Dynamics business solutions, such as financial management, enterprise resource planning, customer relationship management, supply chain management, and analytics applications for small and mid-size businesses, large organizations, and divisions of enterprises; and LinkedIn online professional network. Its Intelligent Cloud segment licenses server products and cloud services, such as Microsoft SQL Server, Windows Server, Visual Studio, System Center, and related CALs, as well as Azure, a cloud platform; and enterprise services, such as Premier Support and Microsoft Consulting that assist in developing, deploying, and managing Microsoft server and desktop solutions, as well as provide training and certification to developers and IT professionals on Microsoft products. The company's More Personal Computing segment comprises Windows OEM, volume, and other non-volume licensing of the Windows operating system; patent licensing, Windows Internet of Things, MSN display advertising, and Windows Phone licensing system; devices, including Microsoft Surface, phones, and PC accessories; and search advertising, including Bing and Bing Ads. This segment also provides gaming platforms, including Xbox hardware, Xbox Live, video games, and third-party video games. The company markets and distributes its products through original equipment manufacturers, distributors, and resellers, as well as through online and Microsoft retail stores. Microsoft Corporation has a strategic partnership with CNH Industrial N.V. The company was founded in 1975 and is headquartered in Redmond, Washington. Company description from FinViz.com. Microsoft has broken out after years of lethargy as a designer of Windows operating systems. Every couple of years they would release a new version and revenue would pop for the next 12 months as people upgraded. As the systems became more stable, the number of people upgrading began to decline. With the help of the new CEO that has changed. Now they are moving to a subscription software as a service model on the Office products and versions of their new products. They moved into the cloud with Azure and a handful of cloud offerings. They are expanding into service relationship with enterprise customers. Their Windows Surface tablets have caught fire. The Xbox family of products continues to expand. They are no longer just an operating system and database company. Twenty years ago you could always buy Microsoft and never go wrong because they always went up. After being dormant from 2001-2012 the stock has begun a multiyear rally but a lot of people are ignoring their newfound prosperity because they are remembering the 11 years of lethargy. The company posted earnings of $1.13 that beat estimates for $1.08. Revenue rose to $30.09 billion and beat estimates for $29.21 billion. All of the good news was in the metrics. Each of the forecasts for the individual divisions for the current quarter was higher than analyst estimates. The Personal Computing forecast was $9.95-$10.25 billion and analysts were expecting $9.87 billion. Intelligent cloud forecasts were $8.15-$8.35 billion and analysts were expecting $8.15 billion. Overall, the company predicted revenue of $27.35-$28.05 billion and analysts were expecting $27.4 billion. Office 365 revenue rose 35%, Azure cloud revenue rose 85%, gaming revenue rose 38% and Xbox and software revenue rose 35%. Reportedly, high value customers are moving away from Amazon's Web Services to the Azure Smart Cloud. Microsoft languished for years as just a software company but under new leadership, they are surging. Shares declined post earnings but are rebounding with the market. 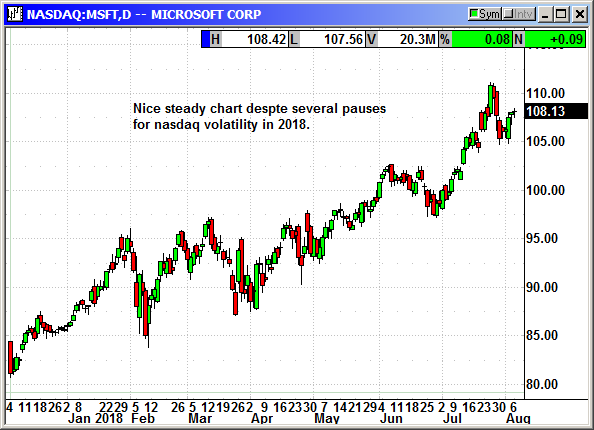 Microsoft's market cap is $830 billion and they will be a trillion dollar company when the stock reached $130.31. Now that Apple has reached that threshold it is only a matter of time before Microsoft and Amazon join the club. 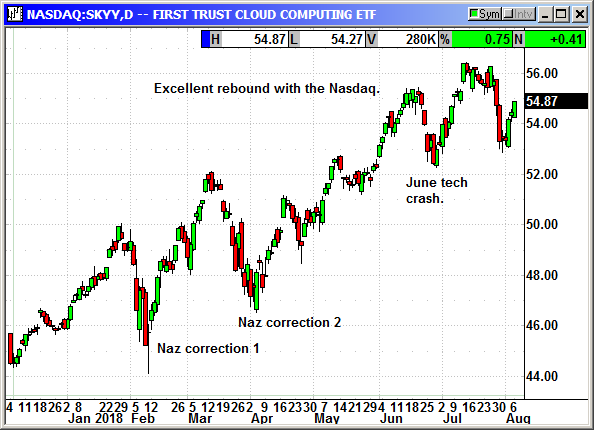 The post earnings decline gave us an entry point and now that the Nasdaq is rebounding I think it is safe to buy a big cap tech stock. If the Nasdaq is going to overcome the normal Aug/Sep weakness there could be significant short covering from institutional traders already positioned for the decline. We are going to use a November expiration to get us past the October earnings date. That earnings expectation is what supports the premium. We will not hold the position over the October 18th earnings. Buy Nov $115 call, currently $2.11, stop loss $104.65. 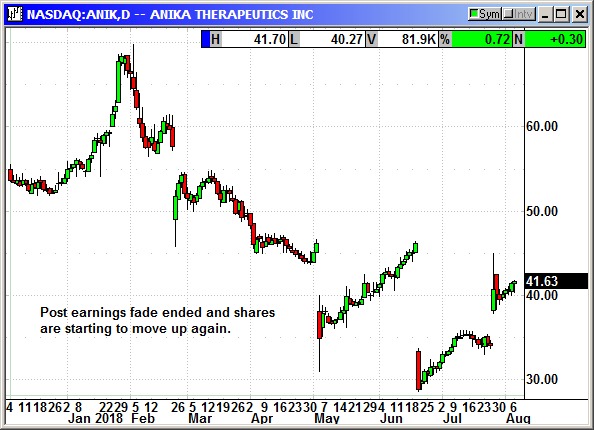 We had a position in Anika using the August calls. We closed that last week and I am recommending a new position using the December $45 calls. Buy Dec $45 call, limit order $2.00, stop loss $38.00. I am using a limit order because there is low open interest and the bid/ask spread is $1.50/$4.80. This is a new option series so the prices have not yet settled. The long position was closed at the open on Tuesday. No specific news. Shares are chopping around in the $38-$40 range while they decide which direction to travel. Long Nov $35 put @ $2.50, see portfolio graphic for stop loss. We will exit in September or earlier. 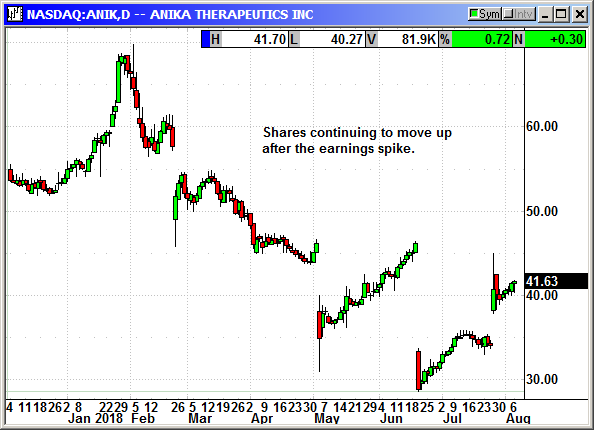 ANIK spiked after earnings the prior week and I recommended we close the August position. I am going to recommend we reenter the position with a December option. Original Trade Description: July 2nd. Update 7/30: ANIK reported earnings of 68 cents on revenue of $30.5 million. Analysts were expecting $33 cents on revenue of $27.9 million. Shares spiked on the news and I am recommending we close the August position. 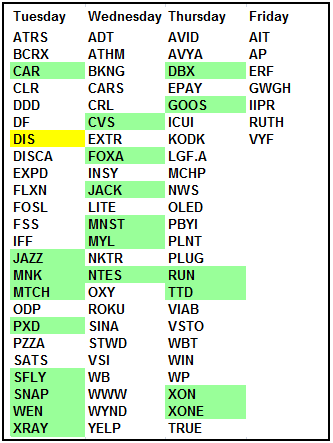 Closed 7/31: Long Aug $35 Call @ $1.45, exit $4.90, +$3.45 gain. No specific news. With Jamie Dimon warning to prepare for 4% on the 10-year or even 5% in the not two distant future, banks should continue to improve. Original Trade Description: July 30th. Bank of America is one of the worldâ€™s leading financial institutions, serving individual consumers, small and middle-market businesses and large corporations with a full range of banking, investing, asset management and other financial and risk management products and services. The company provides unmatched convenience in the United States, serving approximately 67 million consumer and small business clients with approximately 4,400 retail financial centers, approximately 16,100 ATMs, and award-winning digital banking with approximately 36 million active users, including 25 million mobile users. Bank of America is a global leader in wealth management, corporate and investment banking and trading across a broad range of asset classes, serving corporations, governments, institutions and individuals around the world. Bank of America offers industry-leading support to approximately 3 million small business owners through a suite of innovative, easy-to-use online products and services. The company serves clients through operations across the United States, its territories and more than 35 countries. Company description from Bank of America. Booming economy, rising rates. That is really all you need to know about this recommendation. The 4% GDP should lift yields on the 10-year treasury to about 3.25% from the current 2.95%. With the Fed on a hike cycle and expected to hike again in Saptember and December, we would see real rates climb significantly over the next several months. 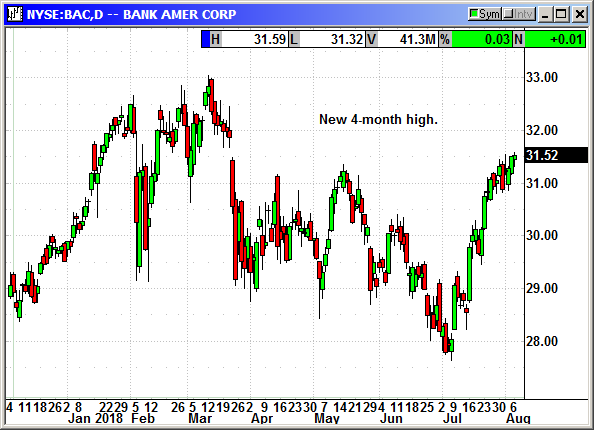 Bank of America is positioned to benefit from this rise in rates. Last week they increased their quarterly dividend by 25% to 15 cents per share. While that is not setting the world on fire, it is an added inducement for investors. The bank also announced it was buying back entire traunches of preferred shares. After months of non performance the banking sector is rebounding on the high GDP and the prospects for the future. The higher interest rates allow them to earn more money and attract more deposits. It is a win-win scenario. Shares are about to break out to a new five month high. BAC shares have been slow movers in 2018 but that may be about to change. The sector has shifted into rally mode and this could continue into 2019 as long as the expectations are not diminished for future Fed rate hikes. Just because the options are cheap, don't back up the truck and open a large position. Until we have a "breakout" it is just a resistance test. 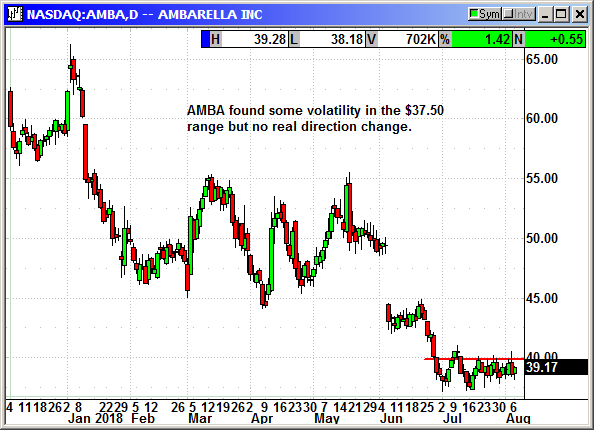 If a breakout does occur it could generate an "all clear" signal for investors. Long October $32 call @ 88 cents. No initial stop loss. No specific news. Shares recovered about half of their post earnings loss to close just under $28. This suggests there could be a rebound market permitting. No specific news. Nearly a new high on Wednesday then crashed with the Nasdaq. Shares are now rebounding with the Nasdaq. Finally a very positive day that cracked support at $30 on the VXX. New 6-month closing low.